When the Vandalur Zoo was set up in 1855, it was the first public zoo in the country. Now, it is one of the best-known and also one of the largest zoos in the country. And it’s just over an hour’s drive away from the city centre! Known as the “Madras Zoo” when it was opened in 1855, the park was established on the grounds of the Government Central Museum of Madras. The director of the museum persuaded the Nawab of the Carnatic to donate his animal collection to the museum and thus grew the zoo. Because of the growing size of the zoo, it was moved around a lot through the city of Madras before it was moved to the Vandalur Reserve Forest. And then in 1985, after years of construction, the zoo was reopened and was named after Annadurai and then became the Arignar Anna Zoological Park. Said to be the largest zoological park in the country, the zoo also has a rescue and rehabilitation center where abandoned wild animals are taken care of. Besides this, the zoo houses around 1,500 wild species (including 46 endangered species) and over 1,265 acres of flora and fauna of different species. 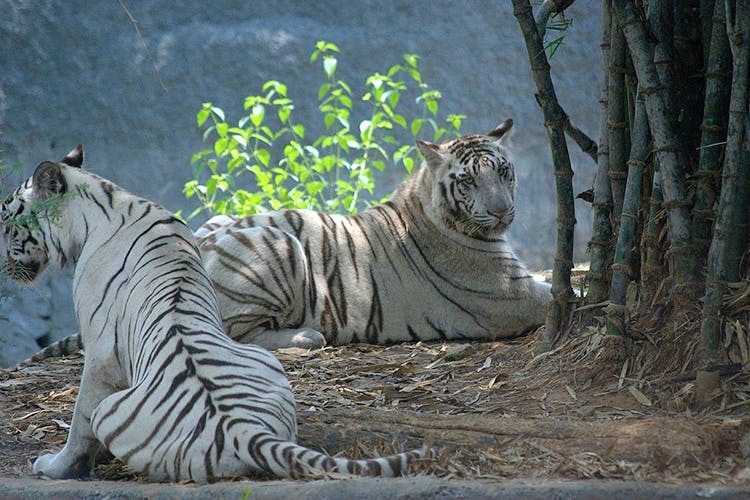 The zoo also has a large number of mammals like the White Tiger And Himalayan Black Bear, birds (the flightless bird from Australia – Rhea), reptiles, amphibians, fish and insects in the park, which explains why it is so popular and so large. And because it was built within the Reserve Forest, the zoo still maintains the vegetation that is popular to this part of the country. All of the animals in the park are housed within enclosures, giving them enough room to move around and make it their home, but also keeping it safe from visitors. There is a lion park that covers about 74 acres and is a 15-minute drive into the safari where the animals are involved in captive breeding. When visiting the lion park, you might not get to see all the lions at once, but the lions will definitely be visible during the drive. A deer park was also opened where visitors can see Sambar, the Spotted and Barking deer. And for those who enjoy elephants, the Elephant Safari was introduced into the zoo, allowing visitors to ride on the backs of the elephants on a tour around the zoo. They also have a reptile house (also known as a serpentarium), an amphibian house, a crocodile enclosure (perfect for those who have not been to the Madras Crocodile Bank on ECR yet), primate house and even an aquarium. The zoo also has a Prehistoric Animal Park and a Zoo School where they have programmes on conservation, education, and awareness, along with zoo outreach and volunteer programs for people to join! Price: INR 20 (for children), INR 50 (for adults).